I recently gave a talk about 3D printing to the Academy of Lifelong Learning . It went really well, other than that I had a head cold. I thought I’d share my slides, and provide some links to supporting and bonus material. The slides for the talk are shared using iCloud, and should work with any recent browser. The link is RIGHT HERE. 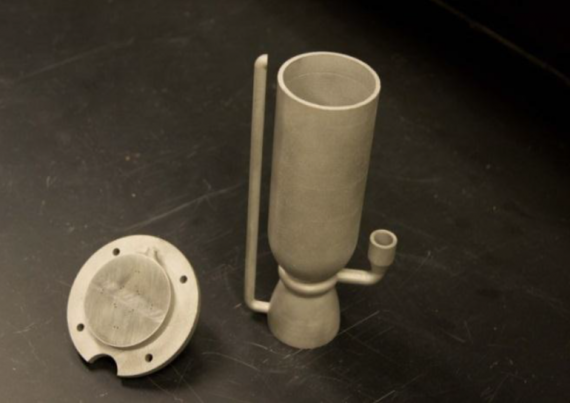 Following are a set of relevant and interesting links about 3D printing. Several of these topics came up in the Q&A. 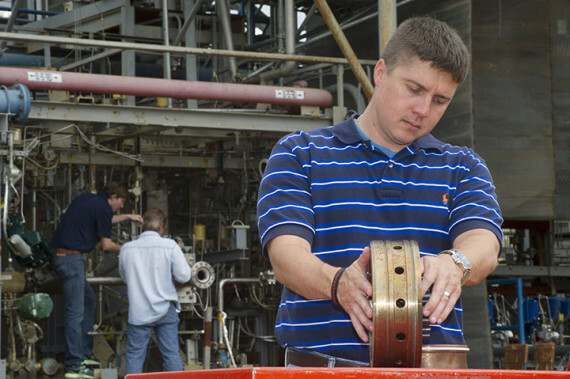 University of California San Diego; Students for the Exploration and Development of Space (SEDS). 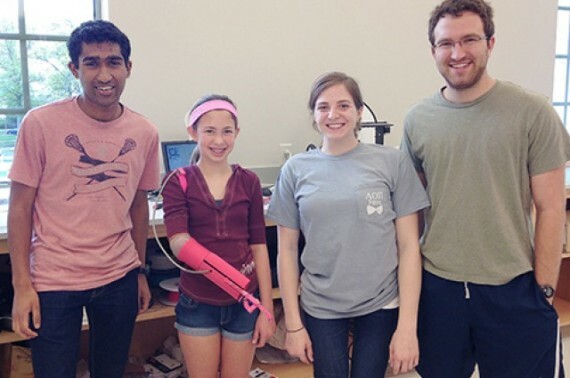 Students use 3D printing to make a prosthetic arm. 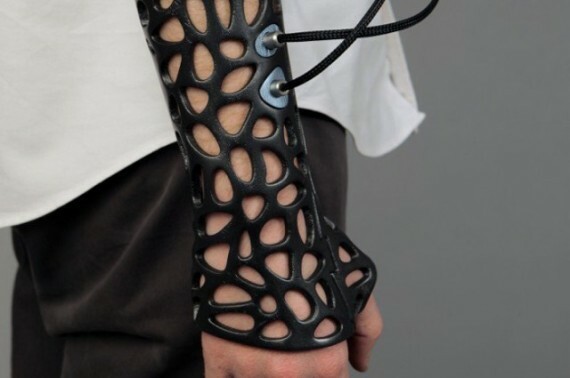 Dad builds son artificial hand on 3D printer. Kinematics from Nervous System on Vimeo. 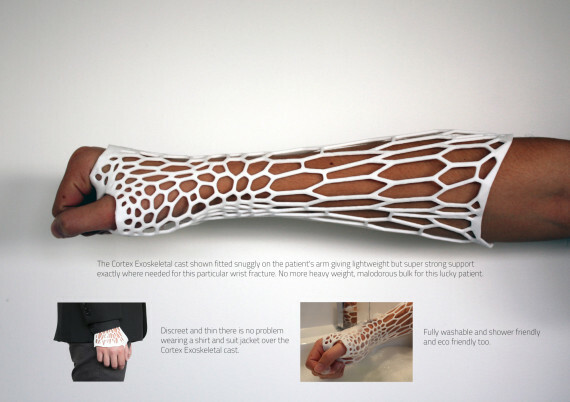 There are many, many more examples of the usage of 3D printing. Leave examples that you’ve found, or think are interesting in the comments! Ok, confession time. I succumbed to the 3D printing fad thing. I know. I made fun of 3D printer fanbois in the past, but we got one at work. Using it for a bit forced me to realize that they’re actually pretty cool. 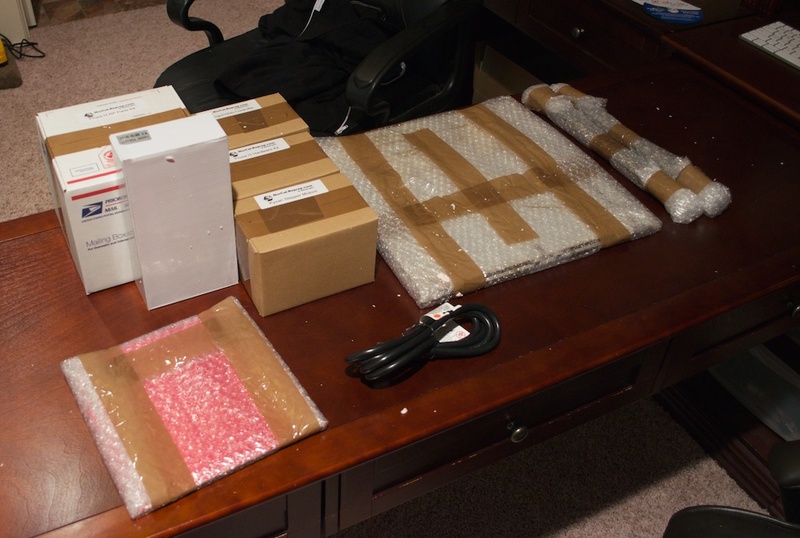 My kit of reprap parts! 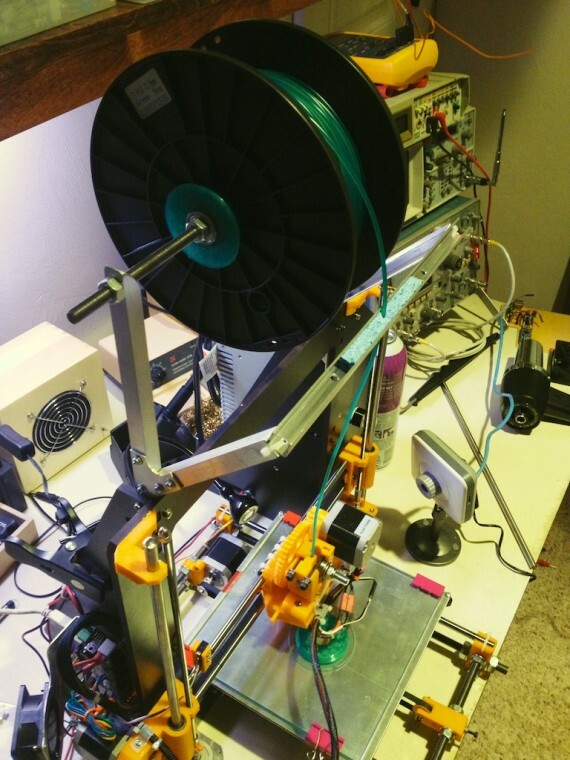 I asked my whole family to chip in for a RepRap Prusa i3 kit for my birthday (in September, to give you an idea of how behind I am). It came relatively quickly, but there were certainly some issues. For one, everything smelled –very strongly– of cigarette smoke. Luckily, it was mostly isolated to the outside of the packaging. Once I unpacked everything, it went away. Aaaarg! Two sets of threaded rods! Then, I discovered that I got two sets of threaded rods!! That wouldn’t be so bad, except that I didn’t get any smooth rods! I emailed the company, and they got a replacement set of smooth rods in the mail right away, but I still had to wait a while. In the mean time, I figured that 5/16″ is awfully close to 8mm. 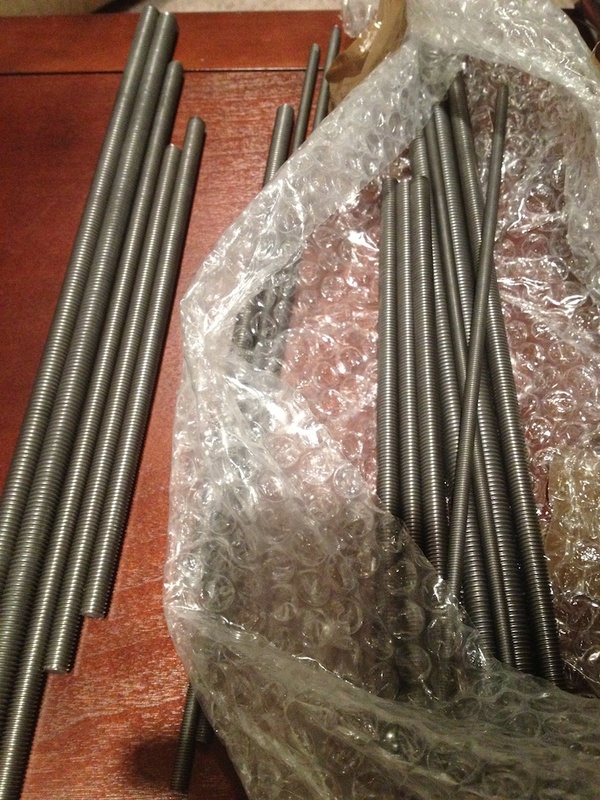 I bought some 5/16″ stainless steel rods from the hardware store to keep working on the printer. The 5/16″ rods are undersized for the LM8UU linear bearings (they’re designed for 8mm rods), so there was extra slop in all the axes. Eventually, the 8mm rods came in the mail, and I installed them. There were a few other minor issues. For one, the melamine material that was used for the main frame was thicker than the laser-cut slots. I had to carefully trim the tabs so that they would fit. It may be difficult to understand what I’m talking about without photos, but all that’s important to understand is that there were some attention to detail issues. After printing for a while, I noticed another problem with the melamine. It’s also used in the frame that holds the build platform to the Y axis bearings. The frame material wasn’t strong enough to level the platform. When I lengthened the screws on the low sides, the frame would just bend downward rather than moving the platform. I found a place in town that sold me a sheet of 3/16″x1’x2′ aluminum for $5, from which I cut out a replacement frame with my scroll saw. Other than those problems, everything went together smoothly. One interesting thing about RepRaps (the models that I know about, anyway) is that they don’t really include something to hold your spool on. I almost think it’s to give people something to design and print out of the chute. My solution was to build a frame using aluminum channel stock. I started with just the upright part of the spool holder. Then, the spool spun a bit too easily, and it would unspool and catch on things. The angled portion holds a dry sponge with a hole in it. This has the dual purpose of wiping the dust off of the filament and providing a small amount of friction. The reprap is all finished. The final issue I had was with the GFCI circuit in my office. I can’t figure out why I have GFCI there, but I do. To add insult to injury, my firewall/router/server is on the same circuit. So, every time the printer trips my GFCI, it takes down the internet and generally causes havoc. I pulled my hair out over this one. I replaced my (very expensive) GFCI circuit breaker and the printers power supply. In the photo above, I’m trying to measure the peak ground current from the printer. The fluke is on the mA setting with peak hold. This is the highest reading I ever got, and the circuit didn’t trip. 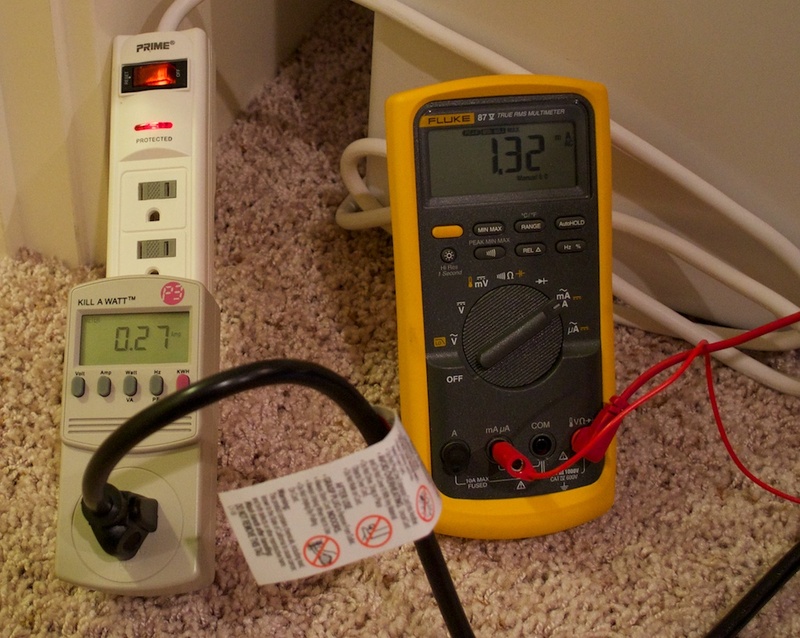 It’s my understanding that GFCI trips when there’s about 30mA on the ground circuit. My assumption at this point was that the shunt resistance in the DMM was limiting the peak current, therefore no 30mA spike and no trip. The problem persisted for sometime, and I began to suspect the GFCI breaker. I went to an electrician store, and the guy said that they can wear out. After I replaced the circuit breaker, and $50 later, the problem got worse! It would trip even when the printer wasn’t plugged in! At least then, it was no longer an intermittent fault. Now that I could reliably cause the fault, I at least had hope for isolating it. I unplugged everything on the circuit and plugged in things one-by-one. I turned out that a cheap power strip (the same kind as in the above photo) was the culprit. Boooo. The number of projects I'm able to write about is limited by my very constrained budget. Any donation would go directly toward this fund.